A promise kept is like the twinkling stars in the night sky: a constant reminder of something important that makes you who you are.Can nine-year-old Tutti keep a promise-and a secret? Her family's life may depend on it.In the early 1930s, life for the Jews is on the brink of ruin: Hitler has come to power, and the golden memories of happy times are fading fast. One young couple, Margret and Heinz Lichtenstern, decide to flee Germany with their parents and daughter, Tutti. They move to Amsterdam, where Heinz is able to continue his work and where there seems to be hope for the future. Two years later, Tutti's brother is born, and the family is prospering.But then Germany invades the Netherlands. And in the pre-dawn hours of May 10, 1940, the Lichtensterns suddenly learn that they have not moved far enough. This is the true story of what the Lichtensterns endured under the Nazis. 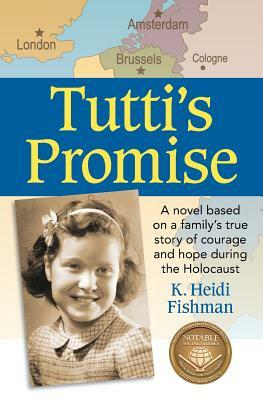 Told by Tutti's daughter, Heidi, and filled with historical documents and photos, it vividly recreates how one family conquered fear and heartbreak to survive. Theirs is a tale of both unimaginable devastation and lucky surprises-raids, sabotage, helpful friends and strangers, and a very special gift.One family. One remarkable story. And in the end, a promise kept.